Everyone has a story about prolific zucchini. I must confess that it isn’t my favorite vegetable. I love to cook and have tons of creative recipes, but the whole thing leaves me feeling “meh” after eating it. 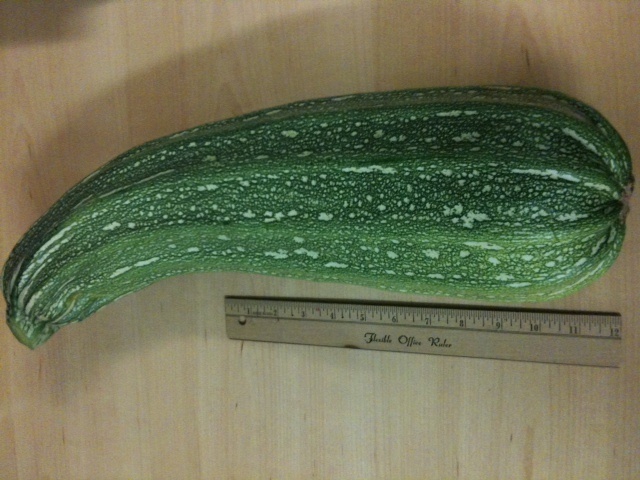 So all season I have been bringing my zucchini in and giving it away to coworkers. I’ve also sent all my friends home with zucchini if they stop by the house. The thing about the variety I am growing is that if you happen to miss one, or don’t check for a few days, they grow to be these gigantic sizes. It’s a bit insane. The good news is that the variety I am growing doesn’t get stringy and seedy when it gets monster sized. You know, why the heck are there hunger problems in the world? This morning I picked the biggest one to date and it could surely feed a family of four. Or five. Or ten. Apologies for the hideous photo. It was taken on the fly with my iPhone camera in a dark office with zero natural light. I’m new at this website thing!